Let me start by saying, I’ve supported you from almost day 1, before you were the powerhouse brand that you are today. In my early days, I wore these vintage 80s Nike Canvas Tennis Shoes for five years in a row. I had them in every color – light blue, navy blue and red. I lived for these shoes. 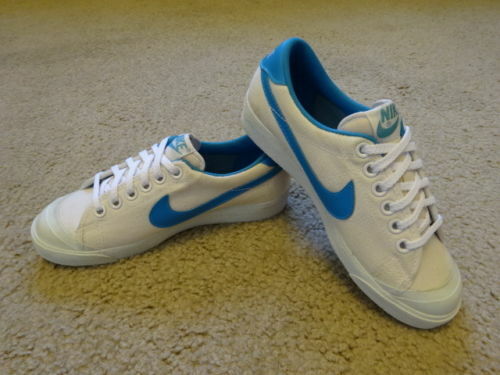 That is when my love affair with Nike began. Over the years, I’ve bought pretty much everything you’ve put in front of me. Nike was a brand that essentially raised me. Then I gave birth to four beautiful and athletic children. They had Nikes as soon as they could walk. So now you’re raising my kids. My first Nike snafu began with the Nike Elite sock craze that hit HARD in the Plym household last year. 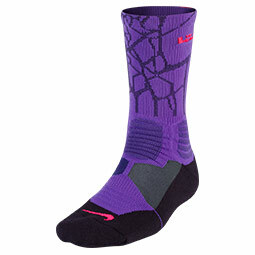 I remember my twin 8-year-old boys telling me they HAD to have Elite socks. That was the first time they ever had an opinion about clothes and style, so I thought “why not?” They are boys and let’s face it, boys typically don’t care all that much about fashion, so why not embrace a new trend for them. And then I saw the $15/pair price tag (which has now gone up to $18-$20! ), and my jaw hit the floor. Lucky for me, my kids are growing up with alot of siblings. We talk about “street smarts” often, and they used their noggins to score a big loot of Nike Elites right out of the gate. Remember, they are twins, and the timing of the Elite craze hit right before their birthday. They must have told every friend that they wanted a pair of these over-priced socks. They received 14 pairs of socks that year – 7 for each of them. Just like you to invent the perfect birthday party gift at a $15 price point. Genius, as usual. I must admit, those socks have held up way beyond my expectations. I mean do kids socks really vary in their performance? These socks did and I’ll give that to you, Nike. But here’s my REAL PROBLEM. Your Nike Free’s for kids. Put those socks aside. As a parent who has been raised by Nike, I have ALWAYS loved your shoes. You know when you buy Nike, you are buying a good quality shoe that will last. You knew that when the kids started really drinking the Nike Kool-Aid, we’d eat your shoes up. And we did just that, year after year. Because my mother taught me one thing, never to skimp on shoes no matter what. You get what you pay for. Most of the time. 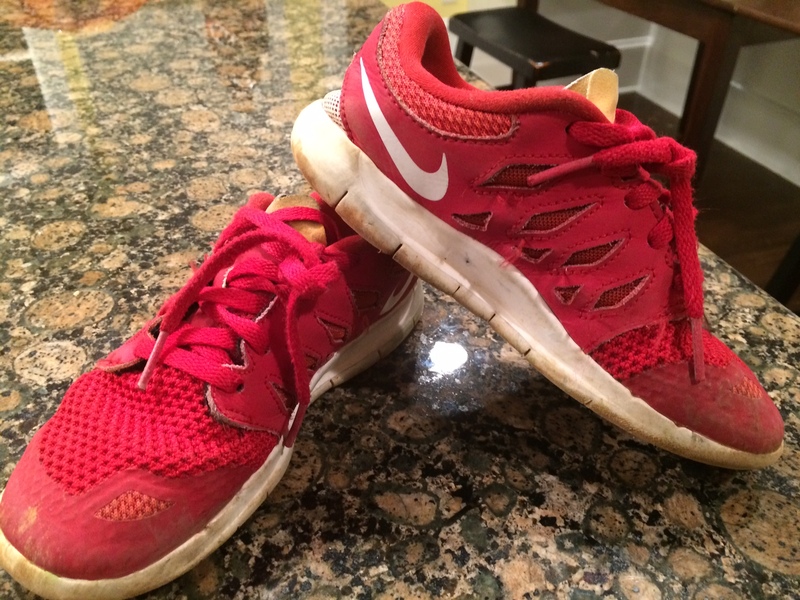 But this most recent back-to-school season, I bought the worst batch of Nikes for my kids ever. The Nike Free 5.0. 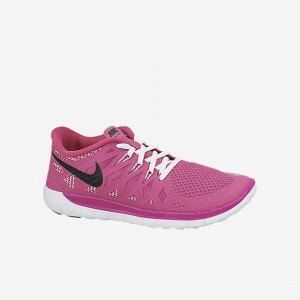 These fetch an $85 price tag, unless you can find them at Nordstrom’s Anniversary Sale. We bought these x 4 kids and they literally disintegrated before my eyes. After the first wear, the paint started smearing off all sides of the shoes, even the Nike swoosh logo was disappearing before my eyes. WTH, Nike? I feel like I’ve been cheated on. I decided to do some Smarty investigating and found out some interesting tidbits about what this shoe was made for. 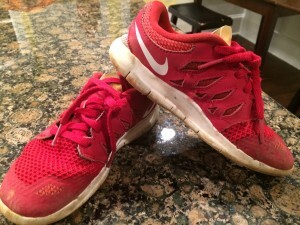 “Nike Free shoes are specifically designed to let your feet move more naturally and freely than traditional athletic shoes”, according to Nike. These shoes were designed for the Kenyan Olympic athletes (who, P.S. are not children), to be as free and light as possible when they are making Olympic history. So my question is WHY DID YOU TRANSLATE THIS TO A KIDS SHOE?????? We need our kids shoes to be made of Superman’s steel, Nike. Especially when you’re asking us to pay $85 a pop. I had to replace my shoes after 2 months, x 4 kids. In my 13-year run as a savvy Mom, I’ve never had to do that. Ever. So I would like to propose this. Please stop marketing these as a kids shoe. Adults can wear them all day long and they will probably serve the right purpose for them. But kids, uh-uh. Oh, and guess what? This is all the stores are selling these days. And double guess what? They won’t let you return them either. Some stores have even put a warning out for parents when they buy Frees. You’re basically driving home throwing $20’s out your window. Because I can promise you this, your kids won’t be able to wear them in public after 2 months. They’ll be that trashed. So I’m calling you out, Nike. You knew exactly what you were doing – you knew we parents would buy anything you put in front us, because you raised us. And now you’ve brainwashed our kids. Well for that, I’m out. Never again will my kids own a pair of Nike Free’s. I’d rather buy athletic shoes at Wal-Mart after our 2K14 back-to-school performance.